SINGAPORE - From hot Wagyu beef and Kurobota pork dishes to snacks, beverages and dessert, a new cafe at Suntec City will have many things other Japanese restaurants boast - except for waiters and a kitchen. Instead, customers will buy their food from six automated retail machines, which are smart vending machines. These machines, which accept only cashless modes of payment, are able to track sales and inventory data to alert the retailer via e-mail or SMS when stocks need to be replenished. They also capture the expiry dates of the inventory to ensure that expired food items are not dispensed. The data captured can also be mined for analysis on customers' behaviour and product preferences. Information on the machines' performance is transmitted to a service centre, allowing for remote troubleshooting. The 200 sq ft cafe, which still does not have a name, will open in the third quarter of 2018. It will be operated by Kalms Singapore, a company that was a household name for greeting cards and gifts in the 1980s. Kalms closed its last four physical gift stores in 2016 before moving into the vending machine business. The firm announced the cafe plans on Tuesday (June 5) at a media preview of its Smart Vending Solutions Gallery at 16 Kallang Place, where the company's range of smart vending machines are showcased. The firm said the machines can be customised to cater to retailers' specific requirements, such as the sale of experiences like luxury car rentals, high-value or bulky products like the Segway, and food items that require proper temperature control. Its chief executive Azan Tengku said: "We aim to help retailers shave at least 50 per cent off their operating costs while enabling them to improve their responsiveness through real-time sales and inventory access." He believes the machines can bridge traditional retail and e-commerce, with retailers being able to sell their products round the clock without the need to pay high rent or employ large numbers of staff. As for the cafe, Kalms said Suntec City was selected because of the number of Japanese frequenting the area. 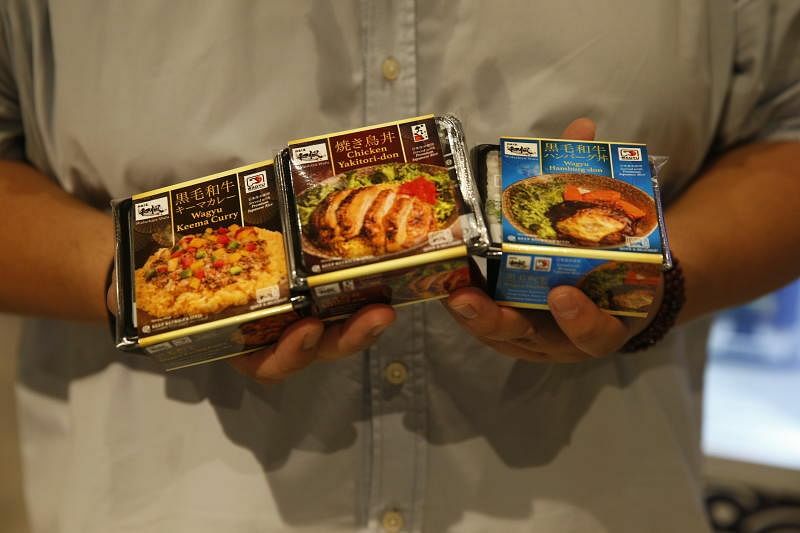 "When we look at vending machines in general, there is none in the market that actually serves really high quality Japanese bento boxes like Wagyu beef, and we wanted to be the first of its kind," said Mr Azan. The cafe will rely on third-party cleaners to assist in maintaining the cleanliness of the space, he added. Besides the cafe, Kalms will also place vending machines offering coffee and snacks at International Plaza. Ultimately, Mr Azan hopes the gallery will show other retailers the potential vending machines have in automating the retail business.